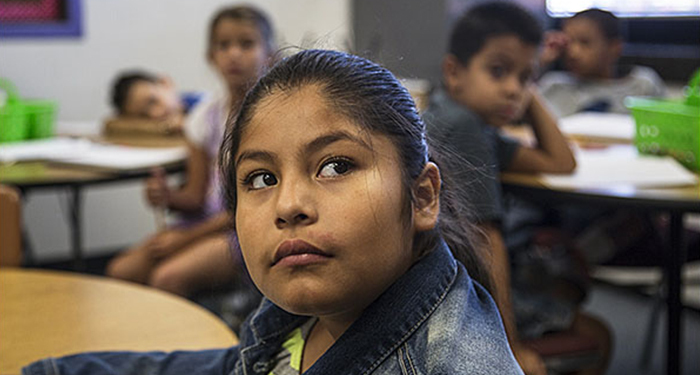 Maritza Fabia, a 3rd grader at Rose Hill Elementary School in Colorado’s Adams 14 school district, listens to her teacher during a Spanish class. The district is under a federal compliance agreement to correct discrimination problems. In one five-year study of a wealthy but diverse suburban district, researchers found school staff members were most likely to act on an implicit bias when they had to make a quick, subjective decision about how to apply school rules and to whom. That was true both for positive choices, such as whom a teacher called on in class, and negative ones, such as which of several misbehaving children to chastise, found Diamond and Amanda E. Lewis, an associate professor in African-American studies and sociology at the University of Illinois at Chicago. “Race and gender influence whether a student’s action is seen as silly or transgressive, a minor annoyance or in need of intervention,” Lewis and Diamond write in Despite the Best Intentions: How Racial Inequity Thrives in Good Schools, to be published in October by the Oxford University Press.